1. Stocks to watch -- Virgin America, Tesla: Shares in Virgin America (VA) are shooting up by 36% premarket after Alaska Air Group (ALK) announced it is buying the carrier for roughly $4 billion, including debt. Alaska Air is offering $57.00 per share in cash, which beat out a bid from JetBlue (JBLU). The deal is expected to make Alaska Air the fifth largest airline in the U.S.
Shares in Tesla (TSLA) are rising by about 4% premarket as investors cheer the unveiling of its highly anticipated Model 3 car last week. Tesla CEO Elon Musk tweeted on Sunday that the company had received 276,000 orders for the new car. If all those orders go through, that's worth roughly $11 billion to the company. However, production is only expected to begin in late 2017. 2. Market overview: It looks like we could have a positive start to the week. U.S. stock futures are edging up and the U.S. dollar is rising a tad versus most global currencies. International stock markets are climbing, after starting the day in negative territory. Crude oil futures have slipped to trade around $36.50 per barrel. Oil prices dropped sharply at the start of the year and hit a low around $26 per barrel, but have since rebounded. 3.Telecom turmoil: Shares in French telecom giants are getting pummeled Monday after a potential merger between two major players was called off. Orange (ORAN) and Bouygues Telecom (BOUYF) said on Friday that they decided to call off negotiations about a potential tie-up. Investors had been hoping that a merger would ease price wars between the four main competitors in the French market. Shares in Orange are down by about 5% while Bouygues shares are off by about 14%. Iliad (ILIAY) and Numericable-SFR, the market's other two major players, were also down by more than 10%. 4. Weekly market recap: U.S. stock market indexes all made big gains last week. 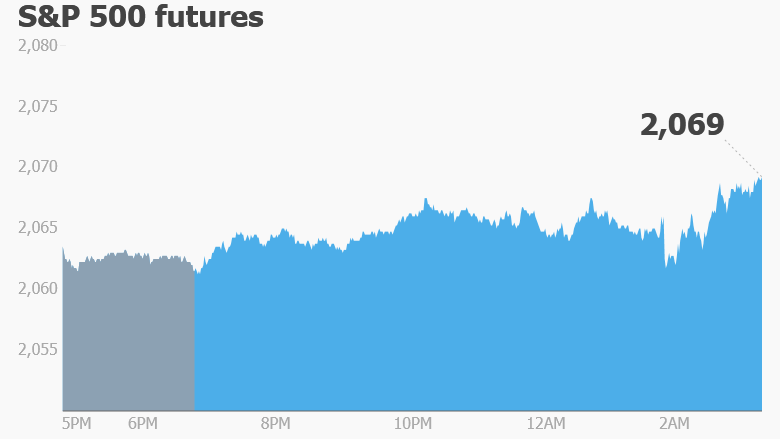 The Dow Jones industrial average rose 1.6%, the S&P 500 climbed 1.8% and the Nasdaq surged 3%.